Mexican meals are one of my favorite things to make. Last week I had some ingredients that I needed to use up: mexican cheese, tortillas, and some enchilada sauce, so I decided to create a fun twist on enchiladas! 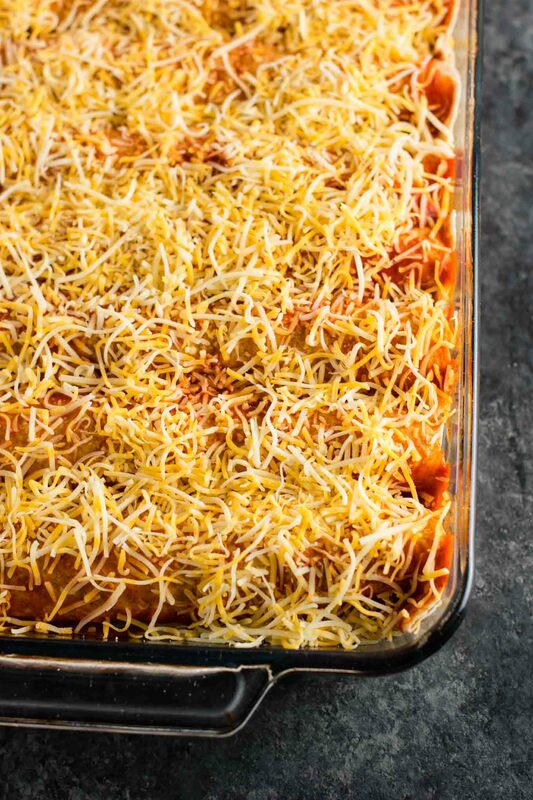 My husband and I love my Best Ever Veggie Enchiladas, and my sweet potato black bean enchiladas, but I wanted to try something different and simpler for this recipe. 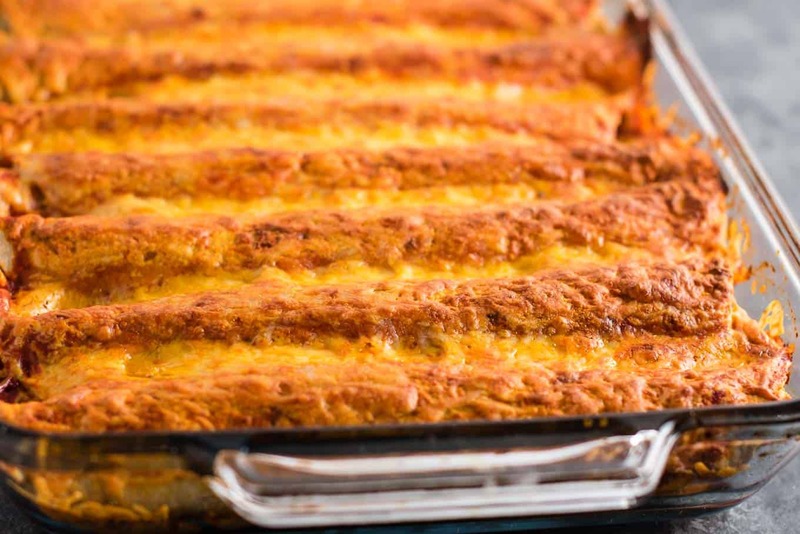 These Refried Bean Enchiladas take no time at all to throw together and look seriously impressive. Mushrooms are by far my favorite veggie to use, but any veggie would work well in this recipe. Try substituting summer squash or bell peppers for more fun flavors! 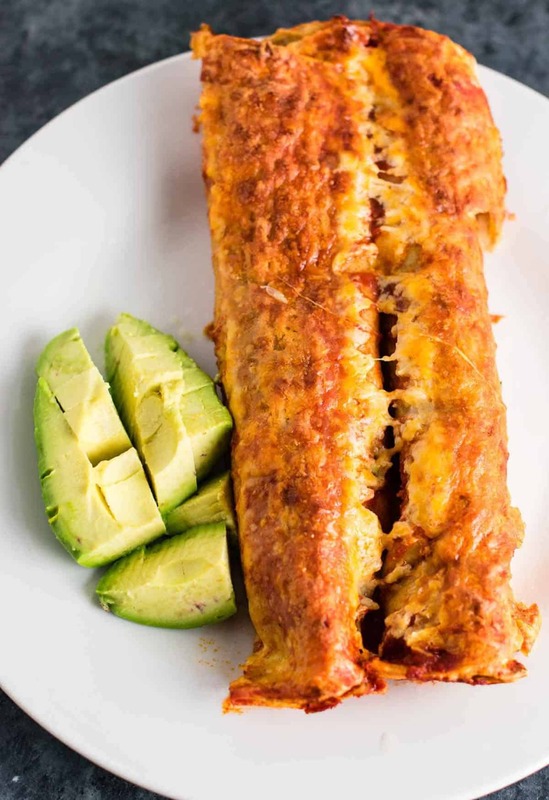 The filling for these enchiladas is so easy to make. I made a batch of my Homemade Refried Beans to pair with the sauteed mushrooms and onion. When you make the refried beans for this recipe, drain off almost all of the liquid from the can. This will make the refried beans super thick, which is perfect for these enchiladas. 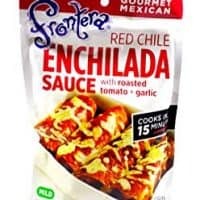 The less liquid the better or you will end up with overly soggy enchiladas. We topped ours with lime juice squeezed on the top and fresh avocado slices. Do not skip this step as it really brings out all of the flavors. The fresh lime is key, and the avocado is a great contrast of flavor. These enchiladas reheat very well in the oven and I had leftovers for lunch the next two days. It works better to reheat enchiladas in the oven as it keeps them from getting too soft. 8 enchiladas fit perfectly for me in a 9 X 13 casserole dish. You just want to make sure the enchiladas can lay flat and are not too scrunched up, or they may not bake correctly and get soggy. Use multiple pans if you need to. I was very impressed with how delicious they were with so little prep work. Are you making this recipe? I want to see! Don’t forget to tag me on instagram @buildyourbite and hashtag #buildyourbite with your recipe pictures. 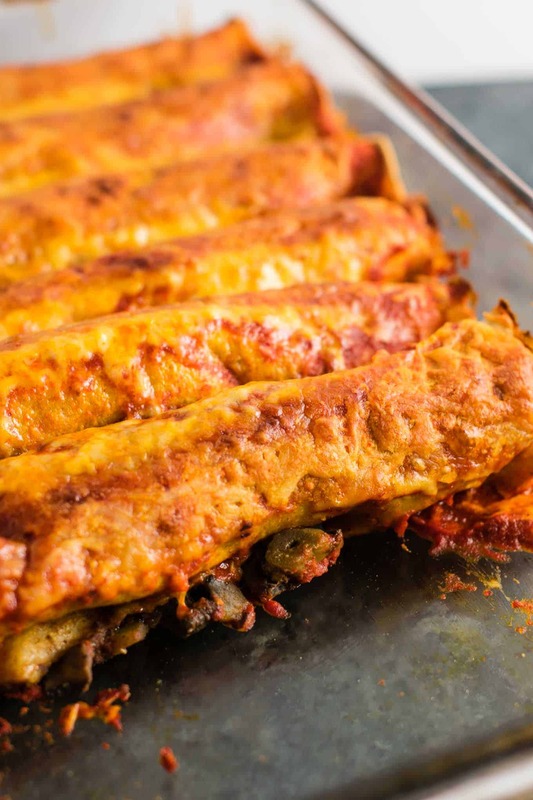 Refried bean enchiladas with mushrooms. 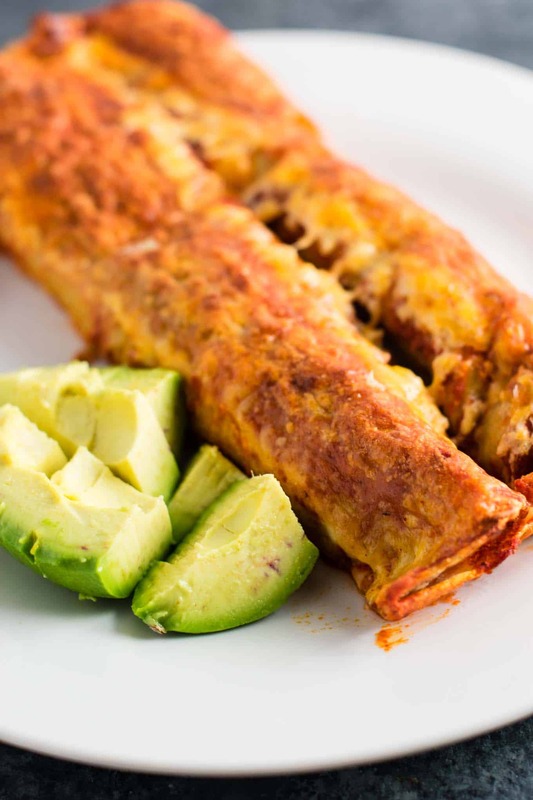 A vegetarian enchilada recipe made with homemade refried beans. Cook one batch of 5 Minute Homemade Refried Beans and set aside. Drain most of the liquid from the beans, as we want these to be super thick for this recipe. 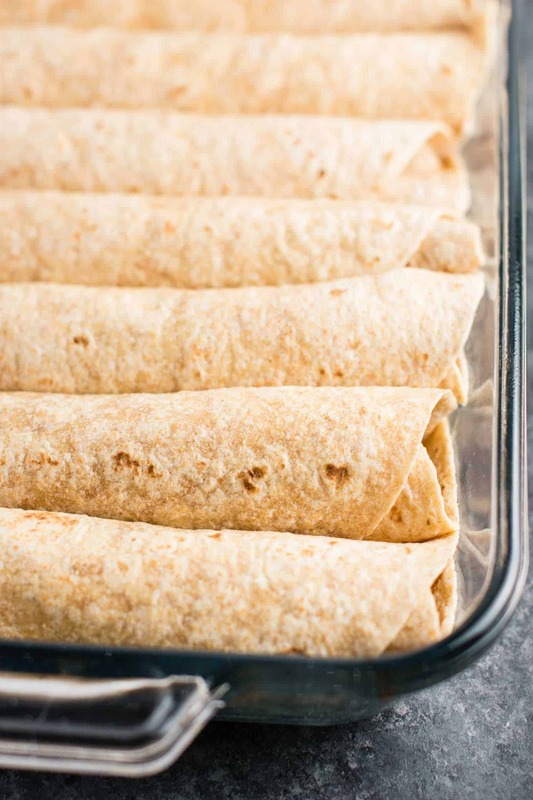 Microwave tortillas until warm. Do this prior to filling to help the tortillas not crack when rolling. Love refried beans so these look totally amazing! I will have to give these a try! Hi. For the crock pot ziti can I double the recipe? How long would I cook it for? You can double the ziti recipe, but you would need to use two 6 quart crockpots. One batch of the recipe will fill an entire crockpot. If you use two crockpots just use the same recommended cook time. Good luck!